Fat Princess has been a long time coming. As an online-focused, cartoon-like game full of humor and violence, it could realistically be seen as the PSN's answer to Castle Crashers (at least until Castle Crashers was confirmed for PSN). 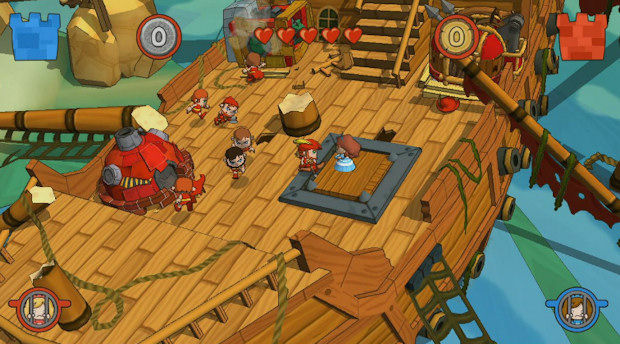 It's quite fitting, then, that a number of overbearing connection issues and lag have managed to rain on Fat Princess' launch parade, as it very much did for The Behemoth's last downloadable title. Despite the multiplayer problems, I've been persevering with Titan Studios' adorable mix of real-time strategy and hack-n'-slash gameplay in a bid to see if staring at endless loading screens is rewarded with some good old-fashioned fun. Luckily, we've managed to find an absolutely brilliant and addictive game that was certainly worth waiting for. 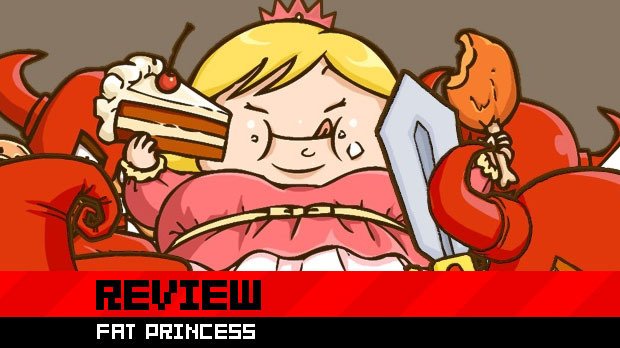 Read on as we review Fat Princess. If you haven't heard of Fat Princess before, there's obviously something wrong with you, but let's quickly inform those who haven't been paying attention. The game pits two teams of sixteen players against each other, representing either the Red or the Blue force. 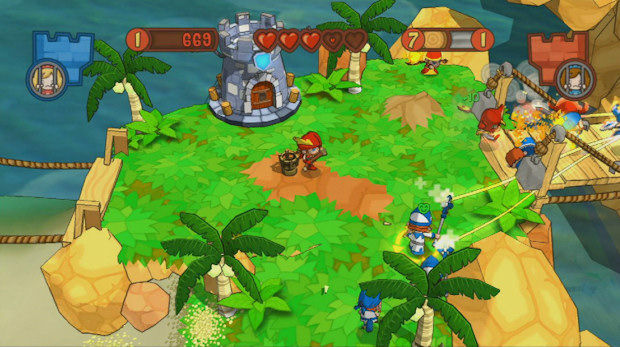 Each force has a castle, where the enemy team's princess is held captive. The aim of the game is to keep your prisoner behind bars while rescuing your own princess and seating her on your throne. The game's main twist is that you can fatten up your captive princess to make it harder for enemies to carry her away. The fatter she gets, the longer it takes for the enemy to make off with her, allowing you a greater chance to kill the rescue party and retrieve the prisoner. It's a genius little gimmick that exemplifies this game's main strength -- the focus on making sure that everybody has something to do. There are five character classes, and players can change class by picking up hats from special "hat machines" in each castle or from the battlefield. In keeping with the idea of giving everybody something to do, each class has its own distinct purpose, and it will take a versatile team that makes use of every class to win the day. Warriors and Rangers make the bulk of a team's offensive force, while Mages and Priests back them up with devastating area-of-effect spells or crucial healing abilities. Finally, there's the Worker, who can cut down trees and mine for resources, which is essential for building siege weapons and upgrading classes. Each class can be upgraded by the Worker to obtain new weapons and special abilities. 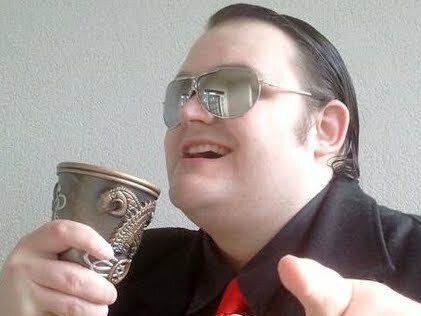 The Priest, for example, can upgrade to a Dark Priest, allowing him the ability to either heal allies or drain enemies. The upgraded Ranger will be able to use either his original crossbow, or a powerful gun that spreads out its shots. The upgraded hat machines for each class also brings its own unique ability. The Worker machine produce devastating bombs, while the Mage machine produces a wonderful potion that can turn its victims into chickens. Every single class has its use, and while players will invariably find their favorite (Priests FTW! ), the game is best played when one switches out classes depending on the situation. If a force is low on offensive power, for example, it makes sense to start picking up Warrior hats. If not enough resources are coming in, it's time to grab the Worker hat and start chopping some wood. While all this is going on, players must also make sure to regularly deliver cake to the captive princess, just in case the enemies breach the castle. The battlefield is also full of strongholds that are captured simply by standing near them. Strongholds have a number of uses, mainly as convenient places for Workers to stockpile resources, but some can also take you directly into your castle, or the castle of your enemy. 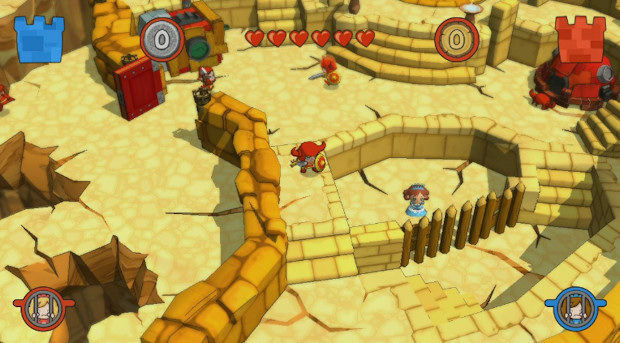 As well as the standard battle mode, players can also take part in regular Deathmatches, where they have to keep killing each other until a limited number of lives run out, or a "best of three" match where players must kidnap the enemy princess three times during a battle to win. Each game type plays fairly similarly, however, with many players able to stick to what they do best in any given match. Fat Princess is incredible fun. The five classes are all a blast to use, the game's really easy to get into, and the simplistic nature of the combat hides an intense and competitive little multiplayer game. The back-and-forth nature of the matches keeps things consistently interesting, and the fact that any type of player, whether they're good or not, can find a role to perform and help the team, is a fantastic asset that keeps all players feeling useful and ensures that nearly anybody can hop into a match, regardless of their skill level. Unfortunately, the connection issues I suffered while trying to play this game were still very prevalent, and it's hampered my enjoyment of the game at times. When I got into a game, it was absolutely fantastic, but so much time was spent looking at a loading screen, or just getting booted from the game entirely and forced back into the PS3's XMB, that things got incredibly frustrating. At least in Castle Crashers, the single-player mode alone was enough to justify the purchase, but with Fat Princess, focus is solely on multiplayer and the short, simplistic single-player mode just doesn't cut it, especially with such useless ally AI. Quite how these problems even exist when they were prevalent during the so-called beta, I don't know. I thought betas were meant to fix this kind of stuff. Despite these problems, however, Fat Princess is just too damn good to stay mad at. Its gameplay is compulsive, which is handy because matches can last an incredibly long time, and the addictive hack-n'-slash is kept appealing with some amazing cel-shaded visuals and a wonderful English commentator who provides helpful status reports like, "They're in our base, killing our dudes!" Extra features like character customization and the rather humorous end credits are just icing on a most delicious cake. 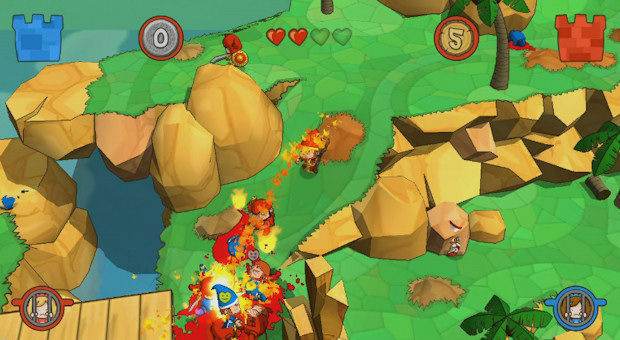 Fat Princess' charm and sense of humor prevails throughout, and it's backed up by a completely honest, simple, and thoroughly fun war game that contains not one pretentious bone in its body. It's a recommended buy, but that recommendation comes with a condition -- wait for the patch, and news that the patch has worked. Once you have that, this is worth your fifteen dollars, without question.